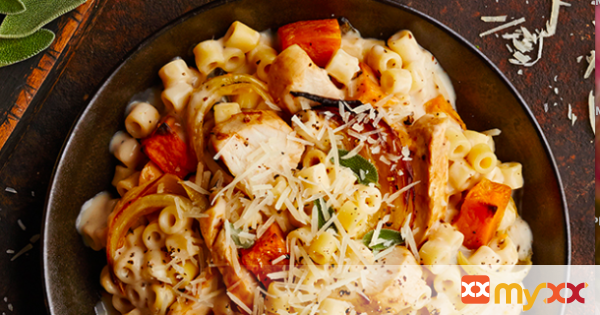 Ditalini pasta with sweet potatoes and chicken. 1. Preheat oven to 400°F. On rimmed baking sheet toss sweet potatoes, onion, olive oil, and sage together. Sprinkle with salt and bake 22 to 25 minutes or until soft and just starting to turn golden brown. Set aside. 2. In a large pot bring 4 to 6 quarts of water to a rolling boil; add salt to taste and the Ditalini; stir gently. Cook pasta according to package directions; remove from heat and drain well, reserving 1 cup of pasta water. 3. Add alfredo sauce to pot along with sweet potato mixture, and chicken; heat through over medium-low heat. Add pasta and enough reserved pasta water to desired consistency; gently stir to combine. 4. Serve topped with slivered almonds and shredded Parmesan cheese. Sprinkle with additional sage, if desired.